Sensuka is a city of many religious orders, and contains within its limits an incredible number of sanctuaries, convents, monasteries, and missions. The monastery of Tanalisca is among the most famous of these, owing to the bizarre structure that rises in the middle of its extensive grounds, known colloquially as “the stairway to nowhere.” This towering stone construction is indeed a staircase, albeit one with the curious peculiarity that the steps, which are quite wide at the base, get progressively narrower as they go up, to the point that the last step, which faces onto a seventy-foot drop, is barely wider than a thumbnail. The ascension of the stairway is treated as a spiritual exercise by the monks at Tanalisca, who will climb as many steps as their confidence in their own sense of balance -or lack of attachment to their material self-preservation- will allow. 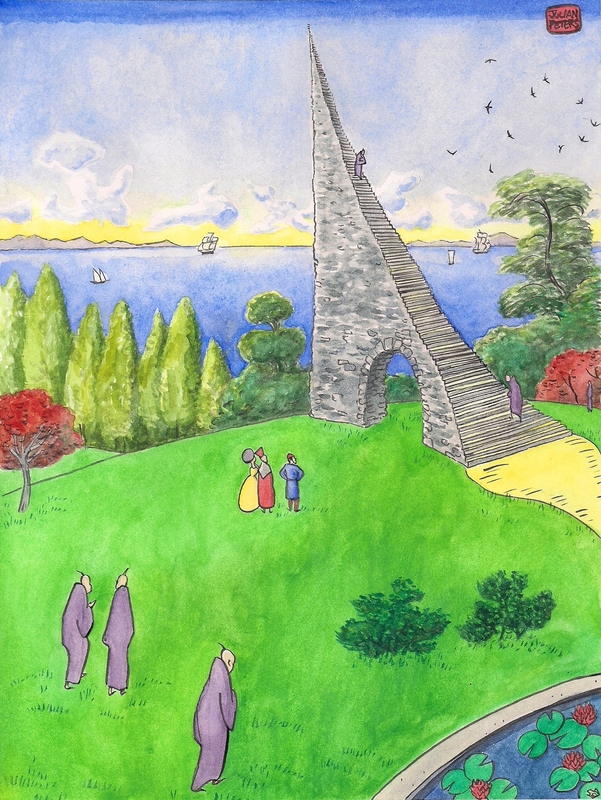 As the monks are fond of repeating, the structure should by no means be described as a stairway to nowhere: Its ascension will, at the very least, lead to a better understanding of one’s own limits, or, failing that, to the revelation of what awaits one beyond this vale of illusions. This entry was posted in illustration, Imaginary City, painting and tagged dead-end staircase, hiroshige, monastery, monks, sehnsucht, stairway to nowhere. Bookmark the permalink. Grazie, Marco! The atmospheres of those authors (to which I would add Dino Buzzati, especially in his “Miracoli dalla Val Morel”) are precisely those that I’m trying to channel here -nel mio piccolo! BTW Hecate’s children are never far from my mind these days, and I am hoping to flesh them out come the holiday break. By turns reminiscent of Calvino, Boccaccio, and sometimes Borges such as is the case here, but always indelibly stamped with your singular touch, Jules! Evocative is one of many words that come to mind to describe this post! Remind me who Ekoric is again? One of the twins or inseparable friends, hiding, walking through the double squares, going back to their hiding place, freedom being their most important asset. Berino Sansuka is a many splendered city, how can one leave at all? I wonder what Ekoric thinks about this challenging path to test peace of mind or trust in the infinite (I can do it, I can go all the way up).